The fixed knot deer fence is favored by stock owners because of its durability to withstand brute force and tough weather conditions. 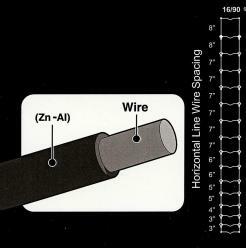 The features for this galvanized fixed knot wire include the high tensile preventing deterioration from acts of nature or predators. The vertical wire design intensifies its resistance to force making it suitable and dependable for livestock enclosures and wildlife barriers. 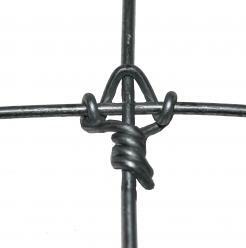 As one of the strongest wire fences the fixed knot is constructed as a separate piece of wire attached to the horizontal line wire, increasing the overall fence strength and allows for widespread post spacing. Because of its unique strength design the deer fence has a 40-50 year life cycle. 6" Opening - Zinc-Aluminum, Black Coated High Tensile Steel Wire - Fixed knot field fencing is the strongest fencing product available. 12" Opening - High Tensile Steel Wire - Fixed knot field fencing is the strongest fencing product available. 6" Opening - High Tensile Steel Wire - Fixed knot field fencing is the strongest fencing product available. This High Tensile Deer / Game Fence is manufactured as a Fixed Knot mesh. There are a number of benefits of using a High Tensile fence over the more traditional soft product that have been used over the last century. Our fence is 12-1/2 gauge class 3 galvanized wire, 6.3ft and 8ft High with 20 horizontal wires and 330ft in length with 6in spacing between vertical wires. It also has a gradient mesh that the horizontal lines get narrower as it gets lower to the ground.